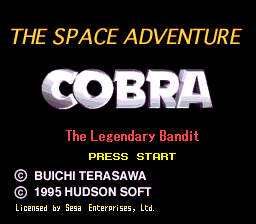 The Space Adventure (Full title: The Space Adventure: Cobra the Legendary Bandit) is an adventure game for the Sega Mega-CD, based upon the manga/anime series Cobra by Buichi Terasawa, and a port of the 1990 Japan-only CD-ROM² game Cobra II: Densetsu no Otoko. Main article: The Space Adventure/Magazine articles. NEC Retro has more information related to Cobra II: Densetsu no Otoko.